PITTSBORO, N.C. (March 2, 2018): Stand 21 makes the highest quality, made-to-order safety gear for motorsports genres worldwide. The company’s 48 year history has built a reputation of quality in their base of France and abroad. Nearly a decade ago, top drag race teams recognized the need for higher quality safety gear and reached out to Stand 21 founder Yves Morizot requesting a drag racing-specific line. The company responded with unsurpassed head-to-toe driver coverage now chosen by names such as Steve Torrence, Doug Kalitta, Larry Dixon, Cruz Pedregon, Alexis DeJoria, and Jonnie Lindberg, among others. 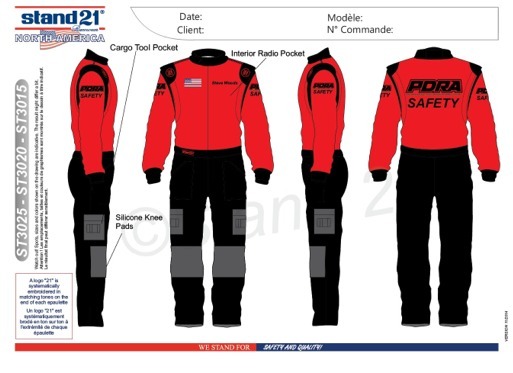 Several PDRA drivers have already chosen Stand 21 custom suits, helmets, gloves, footwear and Nomex undergarments, including Pro Extreme Champion Mike Recchia and Eric Dillard, racer and co-owner of Pro Line Racing. Stand 21 will also pay contingency for drivers who purchase a Stand 21 firesuit. “We also have a Safety Foundation [www.racinggoessafer.org] through which we bring top doctors to discuss important safety issues for the driver,” McConnell added. “For example, most guys don’t know that by wearing Nomex underwear you greatly increase your protection against fire. Or that wearing Nomex and wearing a polyester shirt, like many of the crew shirts, can be detrimental. Fire doesn’t even have to go under a suit to melt that fabric. It can be melted by the heat alone. So there’s a lot of things we can do to increase drivers’ knowledge of safety. Obviously, we want to sell suits, but my hope is to increase the level of education in safety for the PDRA. Visit Kevin at the Stand 21 display at the PDRA season opener, the East Coast Spring Nationals at GALOT Motorsports Park, April 5-7 to be fitted for a custom, state-of-the-art firesuit and receive the PDRA special discount. Visit http://www.stand21na.com for more information. Based in Pittsboro, North Carolina, the Professional Drag Racers Association is the top sanctioning body in the United States for the sport of eighth-mile drag racing. The PDRA’s professional categories include Pro Extreme, Pro Nitrous, Pro Boost, Extreme Pro Stock and Pro Extreme Motorcycle along with several sportsman and various exhibition categories. The 2018 PDRA schedule consists of eight national events. For more on the world’s premier eighth-mile drag racing organization visit www.pdra660.com.